San Luis Obispo is a college town located in California’s Central Coast, where there is a surprisingly diverse range of good eats from the famous Santa Maria-style BBQ to delicious gyro pizza. If you are to eat one thing while in town and are an omnivore, make sure to try the tri tip from one of the BBQ institutions: Firestone or Old Luis Obispo. Both of these beloved spots use the regional style of barbequing over fragrant red oak wood that you can smell from blocks away. Here are nine San Luis Obispo restaurants that are worth checking out. Brave the lines at this massively popular BBQ spot for an addictive tri-tip sandwich or a massive pulled pork sandwich that is worth the stomachache afterward. If you want a healthier alternative, but still want to sample the BBQ, the steak cobb salad with tri tip is a solid choice. There is plenty of indoor seating, but if the weather is nice take advantage of the scenic outdoor space and snag a spot at one of the many tables. Make sure to ask for extra barbeque sauce or ranch sauce, since there’s no extra charge. Firestone is a popular choice when it comes to San Luis Obispo restaurants. Old San Luis Obispo BBQ Co.
Another great choice for BBQ, that is much calmer than Firestone, but just as good. Old SLO BBQ Co is my personal favorite spot for BBQ in SLO. There’s ample seating inside, but the outside seating is much better since it’s located right by the creek. Order from the walk-up window, and make sure to browse their selection of local brews and wines. The star of the show is unsurprisingly the tri-tip sandwich, but there is also the linguica (smoke cured sausage) sandwich that is worth trying out and make sure to get a side of the coleslaw that is lighter than the typical version. I’m not always patient enough to be waiting in long lines for brunch, and this casual café was the perfect alternative. I got a Cobb salad with a delicious vinaigrette and Mustafa got a bagel with tons of veggies and cream cheese. There are also heartier breakfast plates, and sandwiches. One of the best things about this cafe is the spacious interior that features quirky murals on the walls and has mixed worn furniture that is reminiscing of a neighborhood café in Berlin. There is plenty of seating, and I would definitely set up shop here all afternoon if I needed to work. A great spot for sandwiches that is located conveniently right next to the train station. This mom and pop store doesn’t look like much from the outside, but inside they whipped up some seriously delicious sandwiches. One of my favorites is the Turkey Veggie that has a good balance of meat and vegetables. They also have breakfast burritos worth waking up for stuffed with a choice of bacon, sausage or veggies. If you’re a fan of fried stuff, the deep fried pickle spears are not to be missed. Pro tip: call in before you go to beat the lunchtime rush. Known for its famous clam chowder, there are many ways to enjoy the signature dish including in a bread bowl fully loaded with crabmeat, cheese, bacon and chives. Though claim chowder gets the most attention at this café, there are many other delicious items like the breakfast burritos, sandwiches, and sweet and savory baked goods. There are a lot of fresh seafood options as well like lobster rolls. This is a great spot for an inexpensive, but delicious meal. Pismo Beach has a branch, but this is a less chaotic spot since you don’t have to fight the pier crowd. I discovered this Mediterranean spot the first time I visited SLO and I have been a dedicated fan since. I always get the gyro that has an irresistible combo of perfectly spiced meat and pillow-soft pitta bread. There are also unique pizza toppings like gyro meat that is quite popular. They also offer excellent shawarma, kebab, and falafel. Make sure to take full advantage of the unlimited sauce station and the beers on tap. The last time I was there, the owner came by to make sure everything was fine and made sure we had tried all the difference sauces-some serious hospitality. This 24-hour donut shop is one of the best spots to satisfy a late night sweet craving with an impressive array of flavors like Maple Bacon Bar and Circus Animal Cookie. The shop separates and clearly labels the donuts by type, so you can easily chose between options like a cake, a glazed or an old fashion dounut, as well as ones with cereal toppings or maple frosting. There is also a limited selection of vegan and gluten free options as well. If you want to try a whole selection, take advantage of the reasonable priced box of a dozen. Technically not located in San Luis Obispo, but in nearby Arroyo Grande. 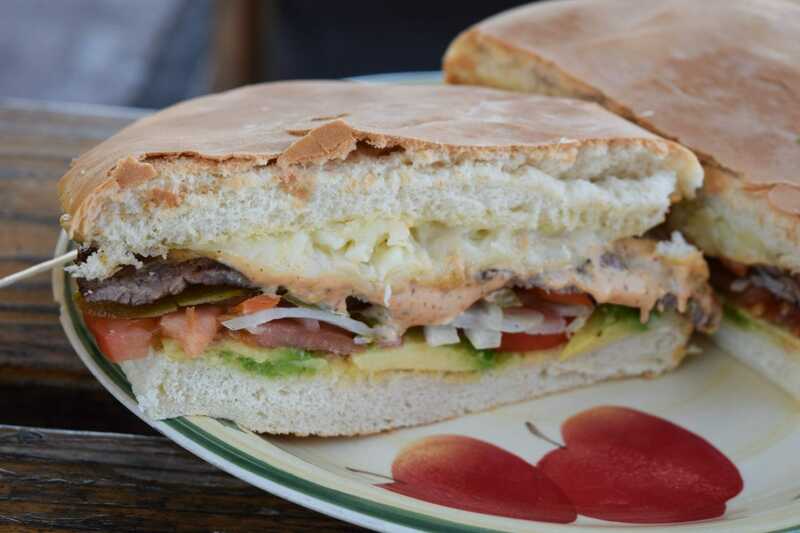 This tiny stand is known for its huge tortas (try the Cubana), but they also have unbelievable fish tacos that are served with homemade blue corn tortillas that are so soft and soak up the sauce perfectly. The pitchers of freshly made aguas frescas are excellent with or without alcohol. There is limited outside seating, but you can take it to go and eat it picnic-style at neighboring Pismo Beach on the sand by the pier. What are your favorite San Luis Obispo restaurants?